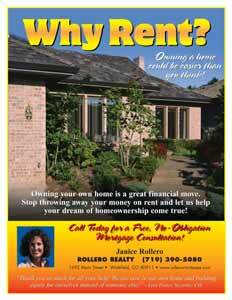 Use the ""Why Rent"" flyer as an insert to your area newspaper, a handout at events, expos, job fairs and seminars. Place in the lobby of your network partners (retailers and service professionals). 8.5 x 11, 100lb gloss text. Customize It - Once you've placed your order, you'll upload or email your photo, logo, contact info and any designations you'd like to include. We'll send you a proof, normally within one business day. We don't print it until you say it's ready.